← Who is Jesus? God Yahweh, or Her Son? Life…Its complexity. Do you possess both male and female attributes? In the picture to the left you are each looking at the sparks of life in the dividing of a single human cell. For research purposes, you can go to a list of links to become attuned to the division of human cells, but in all lifeforms that have cell division or other means of reproduction, the Life Pool (i.e. the Pool of Life) is established within all living things that reproduce and/or exist as living creations. The only thing that will be added from Heaven is the individual personage that comes forth at birth. The above pic is the same as the pic below. It was stripped down to reveal what is hidden. If you will examine the pic below, you will see that at the time of division, that the two (male and female) attributes seem to be divided off of one another. Although this is true to some extent, both attributes actually remain in tack. So duplication of a line of decent is being established. At the next division of a new cell, the process is repeated. This division reflects Eve being divided off or from Adam. The spark of life was present in the rib taken from Adam, so all that was necessary or came into play was the Pool of Life delivering the persona and individuality of Eve’s gift of life. This is a two way street and so your persona can cease to exist once detachment of the slow moving human vessel of energy dies off with your persona being coupled to the brain area of the vessel and requires searing to the celestial energy once the coupler detaches itself because remember- the persona is separate from the spark or sparks of life itself, whereas the spark of life is returned to our Mother Yahweh without need of your persona. If however,Yahweh holds your persona in memory, you will receive it back should you pass over. This process is similar to the division of a living cell, because as you pass you are separated from your human vessel, and at that time you are seared to the spiritual body that is your celestial energy. If Yahweh so chooses, and no searing effect takes place, then your persona dies and your spark of life simply returns on to Yahweh without your personality. In effect, you cease to exist except n Yahweh’s memory. If She chooses to forget your persona all together, as in the case of past Judgments of people, then Her memory is wiped clean of your persona or individuality. So where does Life begin? Not just at conception. At conception, like with Eve’s birth into creation through the use of Adam’s rib, you receive your persona. Adam was living proof that he possessed both attributes, and even though Eve was divided off from him, he still possessed bot attributes, except that his male attribute was dominate. In Eve, she too possessed both attributes, and her female was most dominate. Why is Mother Yahweh sharing this truth? So that you each can come to understand how She can be both female and male at the same rime. But in Her case, She can project whichever attribute (male or female) that She desires for whatever situation arises. She can be Yahweh the Warrior, or Israel the Mother of all Light. 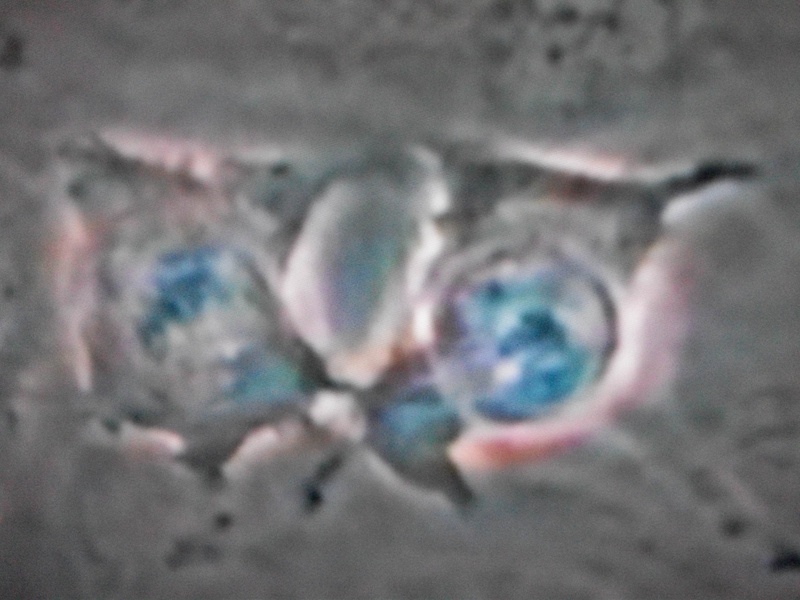 In the division of this human cell, note that one face is male nd one is female as the split occurs. Becoming either of the two does not detract from the other because the new cell still contains both attributes as does the cell it divided off of. This is evident in the next division as the cells continue to divide under Mother’s natural law pf Life’s splitting of the atomic structures process. And I bet everyone thought the splitting of an atom was mankind’s invention. Look for Yahweh’s identifying symbols. The 8 is evident. Some people might believe that the splitting of the atom is something entirely new, but there is nothing new under the Sun. The complexity of life, with cell division as well as what everything entails to endow not only mankind with intelligence in the form of individual personages, but also every living thing on this planet as well as Her other creations spread through out the heavens, the primary process remains the same. I know some will say that not all cell division is for the purpose of reproducing life. Technically, most cell reproduction is for renewal of the present slow moving energy of the vessel’s they divide within. But it is still possible to call upon the Life Pool to send another personage by the cloning process. Since that is not the normal natural intention of Yahweh’s Laws of Nature to clone, what happens when Nature is perverted? Though the Life Pool is tapped to add the new personage to what appears to be an identical look-a-like in every respect, though the persona is different, the aging process is accelerated. Why is that children? Because the perversion, like with the pre-flood Nephilim children that became giants, is also out of the norm that it was intended for. When you make a copy of a musical tape off of a master copy, it sounds good in quality, but if you successively copy each copy or generation down, then you lose or sacrifice the quality you originally obtained from the master copy. Under Yahweh’s Laws, when reproduction takes place, and where sinful effects are not causing harmful effects such as birth defects, the generations of decent do not suffer a degraded effect. This entry was posted in Adam and Eve, Laws, Life, Life Pool, Nature, Science, The Heavens, Yahweh and tagged Creation, Laws of Nature, Life, Science, Yahweh. Bookmark the permalink.